Bizagi Studio requires a database server for your processes repository. Oracle database is supported for the database server configuration. Supported for Standard and Enterprise editions. Express (XE) edition is not supported. •Migrating Oracle databases to Unicode (from non-unicode character sets) is not supported. •For Unicode Oracle databases, string attributes will hold a maximum of 1000 characters. If you need more than 1000 characters, extended text attributes should be used. 1. Create a specific user to be used by Bizagi. You will need to create the user that Bizagi relies on, in your Oracle instance either through an option when creating a project through Bizagi, or by running a script. This user is called the BizagiAdmon user. 2. 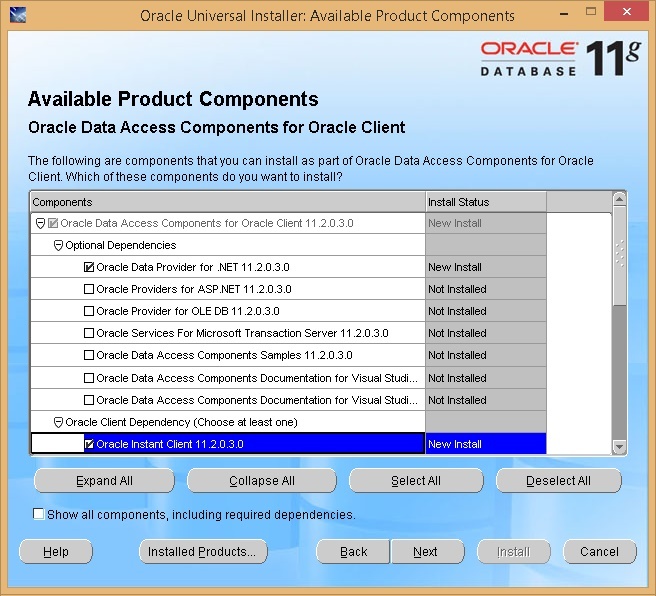 Install the Oracle Data Provider where Bizagi Studio is. Bizagi Studio (and further Bizagi components), rely on the Oracle Data Provider for .NET connector to access an Oracle database. This is not needed at the Database Server but where Bizagi projects (or their components) run. When a project is in its automation stages, this means that you will need to install the Oracle Data Provider for .NET connector wherever Bizagi Studio is installed, either if you have an Oracle database for your process repository, or if you are integrating an external Oracle data source in your Bizagi project (using Data Virtualization / Data Replication). Carry out the steps described next, to make sure that your Oracle instance is set to work with Bizagi. Bizagi relies on a Oracle user for administration and project tasks (i.e, to create the metadata structure of a Bizagi project, create backups, etc). 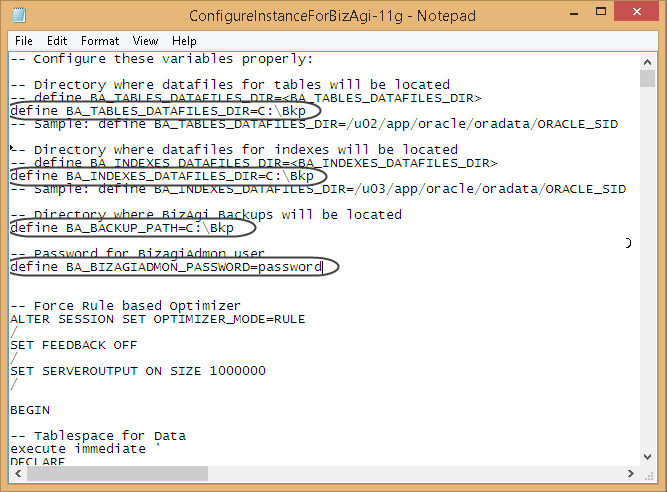 This user is called BizagiAdmon and it is a prerequisite to create a Bizagi project at an Oracle instance. You may choose have Bizagi automatically create this user, or run a SQL script to create this user at the instance. For quick start options, in which you want to have Bizagi automatically create the user, just make sure you specify the sys user (sysdba) credentials when creating your Bizagi project. For information creating a Bizagi project, refer to Creating a project using Oracle. Locate Bizagi Studio installation path and browse into the Project model's database folder (by default at C:\Program Files\BizAgi\ProjectModel\Database\). For Oracle 11g R2, edit the script called ConfigureInstanceForBizAgi-11g. The aforementioned script has a .basql file extension. In other to retrieve the actual script, make sure you rename this file to a .zip and then extract its contents. •BA_TABLES_DATAFILES_DIR: Should be replaced with the path where you want to create the tablespaces datafiles. •BA_LOBS_DATAFILES_DIR: Should be replaced with the path where you want to create the datafiles holding Bizagi LOBS. •BA_INDEXES_DATAFILES_DIR: Should be replaced with the path where you want to create the indexes datafiles. •BA_BACKUP_PATH: Should be replaced with the path where you want to store automatic backups. •BA_BIZAGIADMON_PASSWORD: Should be replaced with the password for the BizagiAdmon user. Run the edited script and make sure it is a successful operation. This script is subject to change in each Bizagi version. Therefore, you should take the mentioned script that corresponds exactly to the installed version of Bizagi. The following is applicable to Oracle versions 12 and it is a recommended guideline due to Oracle's report on BUG 21615091 (https://support.oracle.com/rs?type=bug&id=21615091). 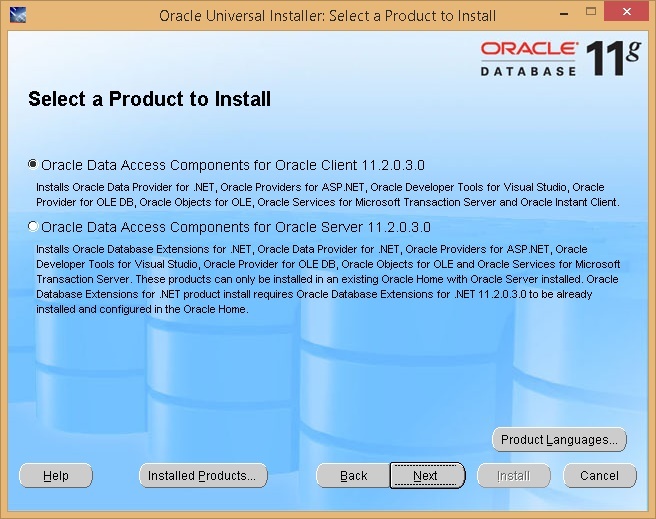 The Oracle Data Provider for .NET is installed through the Oracle Data Access Components (ODAC). Run the installer where you have Bizagi Studio installed. Once finished, you will be notified by this window and you may close the installer. When setting up a collaborative teamwork environment, Bizagi Studio users would need to install this component in their workstations as well. This component is needed if you are using the Data Virtualization or Data Replication features that integrate an Oracle database. •End users do not need to install this component on their workstations (end users access Bizagi Work Portal, which only requires a browser).